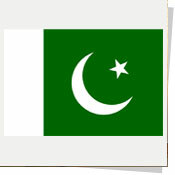 The Islamic Republic of Pakistan is a country in South Asia, marking the region where South Asia converges with Central Asia and the Middle East. It has a 1,046 kilometer (650 mile) coastline along the Arabian Sea in the south, and is bordered by Afghanistan and Iran in the west, India in the east and China in the far northeast. 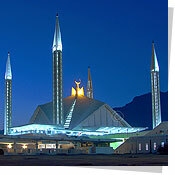 Pakistan is the sixth most populous country in the world and is the second most populous country with a Muslim majority. The nation was founded officially as the Dominion of Pakistan in 1947, under the leadership of Mohammad Ali Jinnah, and was renamed the Islamic Republic of Pakistan in 1956. 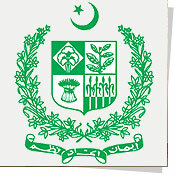 Pakistan was a founding member of the OIC, SAARC, D8 and ECO. It is also a member of the Commonwealth, UN, WTO, G33, and is a nuclear power. 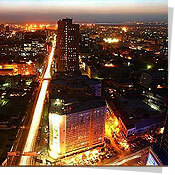 Pakistan is a rapidly developing country, which has faced a number of challenges on both political and economic fronts. Despite being a very poor country in 1947, Pakistan's economic growth rate was better than the global average during the subsequent four decades, but imprudent policies led to a slowdown in the late 1990s. Recently, wide-ranging economic reforms have resulted in a stronger economic outlook and accelerated growth especially in the manufacturing and financial services sectors. There has been great improvement in the foreign exchange position and rapid growth in hard currency reserves in recent years. The 2005 estimate of foreign debt was close to US$40 billion. However, this has decreased in recent years with assistance from the International Monetary Fund (IMF) and significant debt-relief from the United States. Pakistan's gross domestic product, as measured by purchasing power parity (PPP), is estimated to be US$475.4 billion while its per capita income (PCI) stands at $2,976. Despite clear progress, reports by the Asian Development Bank, the World Bank and the UN Development Program place the poverty rate in Pakistan between 23% – 28%.The CIA fact book places the poverty rate at 24% in 2006,and notes that levels have fallen by ten percent since 2001. Pakistan's GDP growth rates have seen a steady increase over the last 5 years. However, inflationary pressures and a low savings rate, among other economic factors, could make it difficult to sustain a high growth rate, according to some analysts. Pakistan has accomplished many engineering feats such as construction of the world's largest earth filled dam Tarbela, the world's twelfth largest dam Mangla, as well as, with collaboration with China, the world's highest international road: the Karakoram Highway. There are also half a dozen additional dams planned such as Kalabagh Dam, Diamer-Bhasha Dam, Munda, Akhori and Skardu Katzara. In November of 2006 China and Pakistan signed a Free Trade Agreement hoping to triple bilateral trade from $4.2 billion (USD) to $15 billion (USD) within the next five years; Pakistan's annual exports in 2005 amounted to $15 billion (USD), and is poised to cross $18 billion (USD) in 2006 and $20 billion (USD) in 2007. Pakistan is also home to a thriving arms industry which exports $200 million (USD) annually, mostly defence equipment and arms to countries in the Middle East and South Asia, and its defence officials are hopeful that these exports will surpass $500 million (USD) a year within the next five years. In keeping with its rapid economic development in recent years, Pakistan registered an economic growth rate of 7 percent in the financial year 2006–07, the fourth consecutive year of seven percent growth. In its June 2006 Economic Survey global finance giant Morgan Stanley listed Pakistan on its list of major emerging markets in the world economy, placing it on a list of 25 countries displaying continued moderate to strong growth over a sustained period of time. The report noted "its economy has been growing quickly in recent periods and corporate direct investors have taken notice". A similar report by State Street Corporation, states that "economic growth (in 2007) has been strong and the stock market has been helped by privatizations as well as foreign investment". Concurrently, highlighting the strides made on the economic front in recent times, Moody's Investors Service in December 2006 upgraded Pakistan's credit rating from B2 to B1, noting a "positive outlook". 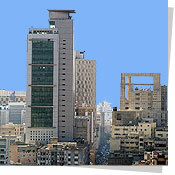 In late March 2007, the Asian Development Bank "Outlook 2007" report predicted that strong growth would continue in 2007 and 2008 with growth rates of 6.5 to 7 percent, with manufacturing, exports and consumer expenditure leading the way.Further progress was highlighted by news that the FDI for FY 2006/7 would touch $7 billion, eclipsing the targeted $4 billion. 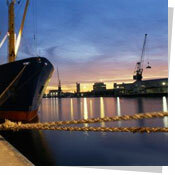 Telecoms, real estate and energy are major industries for FDI. 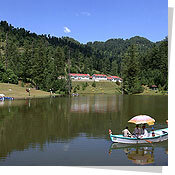 Tourism is a growing industry in Pakistan, based on its diverse cultures, peoples and landscapes. The variety of attractions range from the ruins of ancient civilizations such as Mohenjo-daro, Harappa and Taxila, to the Himalayan hill stations, which attract those interested in field and winter sports. 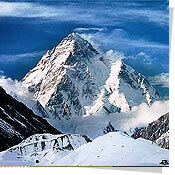 Pakistan is home to several mountain peaks over 7,000 metres (22,970 ft), which attracts adventurers and mountaineers from around the world, especially K2. 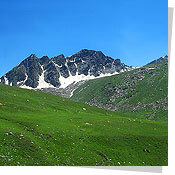 The people of northern areas depend on tourism also. From April to September tourist of domestic and international type visited these areas which became the earn of living for local people. The northern parts of Pakistan have many old fortresses, towers and other architecture as well as the Hunza and Chitral valleys, the latter being home to the small pre-Islamic Animist Kalasha community who claim descent from the army of Alexander the Great. 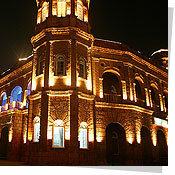 In the Punjab is the site of Alexander's battle on the Jhelum River and the historic city Lahore, Pakistan's cultural capital with many examples of Mughal architecture such as the Badshahi Masjid, Shalimar Gardens, Tomb of Jahangir and the Lahore Fort. 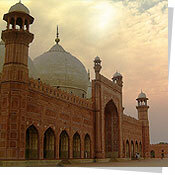 To promote Pakistan's unique and various cultural heritage, the prime minister launched "Visit Pakistan 2007". 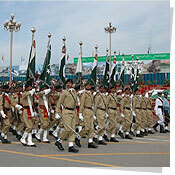 There are many festivals celebrated annually in Pakistan which may or may not observe as holidays e.g. Pakistan Day (23 March), Independence Day (14 August), Defence of Pakistan Day (6 September), Pakistan Air Force Day (7 September), the anniversaries of the birth (25 December)(holiday) and death (11 September) of Quaid-e-Azam, (Allama Iqbal (9 November) and the birth (30 July) and death (8 July) of Madar-e-Millat. 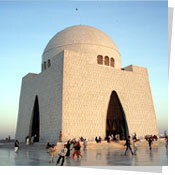 Labour Day (also known as May Day) is also observed in Pakistan on May 1 (holiday). 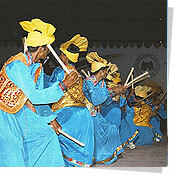 Several important festivals are celebrated by Pakistani Muslims during the year, dependent on the Islamic calendar. Ramadan, the ninth month of the calendar, is characterised by daytime fasting for 29 or 30 days and is followed by the festival of Eid ul-Fitr. In a second festival, Eid ul-Adha, an animal is sacrificed in remembrance of the actions of Prophet Abraham (Arabic: Ibrahim) and the meat is shared with friends, family, and the less fortunate. Both Eid festivals are public holidays, serving as opportunities for people to visit family and friends, and for children to receive new clothes, presents, and sweets. Muslims celebrate Eid-e-Milad-un-Nabi, the birthday of the prophet Muhammad, in the third month of the calendar (Rabi' al-Awwal. Muslims mark the Day of Ashurah on the 9th and 10th days of the first month (Muharram to commemorate the martyrdom of Husayn bin Ali, (the grandson of the Prophet Muhammad). 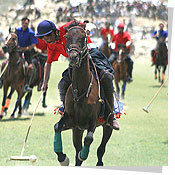 The official and national sport of Pakistan is field hockey, although cricket is more popular. The national cricket team has won the Cricket World Cup once (in 1992), were runners-up once (in 1999), and co-hosted the games twice (in 1987 and 1996). The team came second in the international 20/twenty world cup held in South Africa. 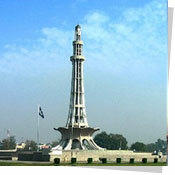 Pakistan is also set to co-host the 2011 Cricket World Cup, with Sri Lanka, India, and Bangladesh. 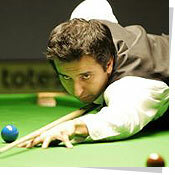 Other popular sports in Pakistan include football, and squash. 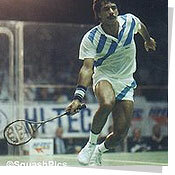 Squash is another sport that Pakistan excels in, with successful world-class squash players such as Jahangir Khan and Jansher Khan winning the World Open during their tenure. At an international level, Pakistan has competed many times at the Summer Olympics in field hockey, boxing, athletics, swimming, and shooting. Pakistan's medal tally remains at 10 medals (3 gold, 3 silver and 4 bronze) while at the Commonwealth games and Asian Games it stands at 61 medals and 182 medals respectively. 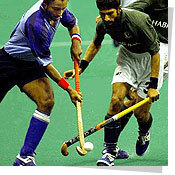 Hockey is the sport in which Pakistan has been most successful at the Olympics, with three gold medals in (1960, 1968, and 1984). Pakistan has also won the Hockey World Cup a record four times (1971, 1978, 1982, 1994). 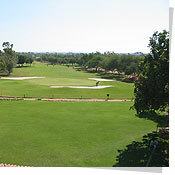 Pakistan has also hosted several international competitions, including the SAF Games in 1989 and 2004. Pakistan covers 340,403 square miles (881,640 km², approximately the combined land areas of France and the United Kingdom, with its eastern regions located on the Indian tectonic plate and the western and northern regions on the Iranian plateau and Eurasian landplate. Apart from the 1,046 kilometre (650 mi) Arabian Sea coastline, Pakistan's land borders total 6,774 kilometres—2,430 kilometres (1,509 mi) with Afghanistan to the northwest, 523 kilometres (325 mi) with China to the northeast, 2,912 kilometres (1,809 mi) with India to the east and 909 kilometres (565 mi) with Iran to the southwest. The climate varies as much as the scenery, with cold winters and hot summers in the north and a mild climate in the south, moderated by the influence of the ocean. The central parts have extremely hot summers with temperatures rising to 45 °C (113 °F), followed by very cold winters, often falling below freezing. Officially the highest temperature recorded in Pakistan is 52.8 °C at Jacobabad. There is very little rainfall ranging from less than 250 millimetres to more than 1,250 millimetres (9.8–49.2 in), mostly brought by the unreliable south-westerly monsoon winds during the late summer. 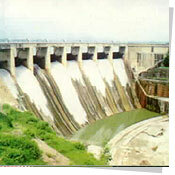 The construction of dams on the rivers and the drilling of water wells in many drier areas have eased water shortages. 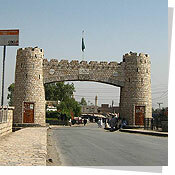 Pakistan is a federation  of four provinces, a capital territory and federally administered tribal areas. Pakistan exercises de facto jurisdiction over the western parts of the Kashmir region, organised as two separate political entities (Azad Kashmir and Northern Areas), which are also claimed by India. Pakistan also claims Jammu and Kashmir, which is a portion of Kashmir that is administered by India. In 2001 the federal government abolished the administrative entities called "Divisions", which used to be the third tier of government. The entities called "districts" (zillas), which used to be the fourth tier, became the new third tier. The provinces and the capital territory are subdivided into a total of 107 districts which contain numerous tehsils and local governments. 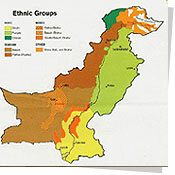 The tribal areas comprise seven tribal agencies and six small frontier regions detached from neighboring districts whilst Azad Kashmir comprises seven districts and Northern Areas comprises six districts.